What? You've never heard of luminous toxin? 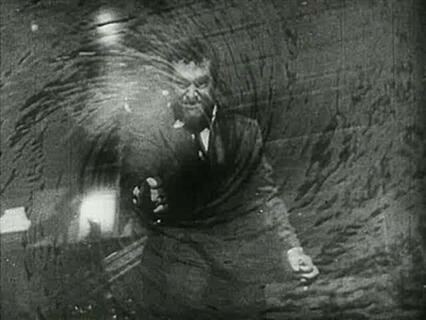 Rudolph Maté’s 1950 film noir D.O.A. is rightly regarded as a classic of this style of filmmaking. It has all the requisite ingredients: a flashback structure, moody lighting, complicated plotting, a general sense of fatalism, tough-guy slang, the inevitable femmes fatales. This enjoyable film dutifully and creatively fulfills its role as a standard-bearer of film noir. And, since it has lapsed into the public domain, you can see it for free online! I’d seen the film multiple times, though not for years, and I like it as much as I ever did. It’s clever and twisty. 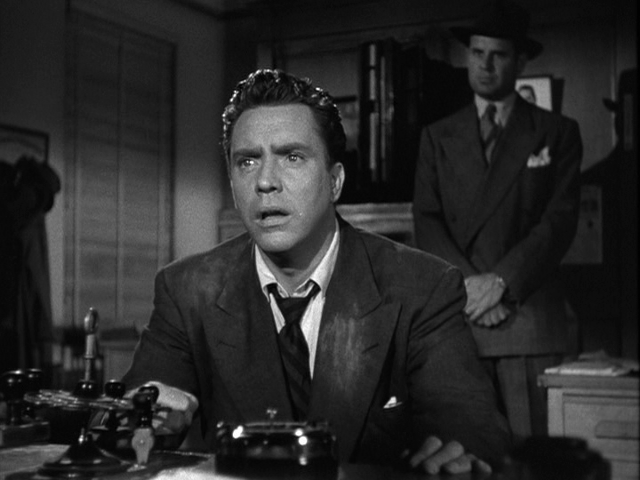 I’m also a big fan of Edmond O’Brien, so his presence was a fun bonus for me. He was a very fine actor who for some reason landed relatively few leading parts; he’s excellent here as the main character, Frank Bigelow. The thing that intrigued me most about D.O.A. this time around was a curious card in its end credits, one that I did not recall at all. To explain why it left such an impression on me, a brief recounting of the film’s story is in order. D.O.A. has one of the all-time great “high concept” premises. A man walks into the homicide division of the Los Angeles police department and declares that he’d like to report a murder. Whose murder? “Mine,” says the man, Bigelow, who then launches into the story that composes the majority of the narrative of D.O.A. In Bigelow's recounting to the police — which we see in flashback — we learn that he was slipped a slow-acting poison while in a bar in San Francisco. After feeling unusual aches and pains, Bigelow visited a series of doctors, who confirmed that he’d been dosed with “luminous toxin,” a poison for which there is no antidote. In his few remaining days, Bigelow committed himself to the complex task of tracking down the person who slipped him the fatal mickey. Frank Bigelow begins to explain his own murder to the police in D.O.A. The story that Bigelow tells the cops brims with the plot twists and reversals for which film noir is justly famous. Those twists — which involve unscrupulous iridium dealers, double-crossing dames and trigger-happy goons — are unusually complicated, even for a film noir. They’re not especially important to the point I want to make here, but I do encourage you to give D.O.A. a look. Its snaky story is a delight to follow — or to attempt to follow. The medical facts in this motion picture are authentic. Luminous toxin is a descriptive term for an actual poison. Technical Adviser, Edward F. Dunne, M.D. And, as we all know, if Edward F. Dunne, M.D., says it, it must be true. 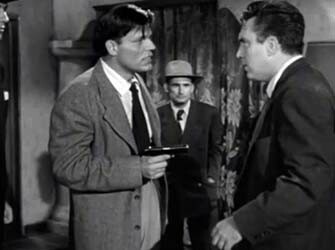 Neville Brand (L), as the gun-crazy Chester, steals most of the scenes he's in. “A descriptive term for an actual poison” is a rather vague phrase, giving no genuine hint of what “luminous toxin” might be. I’m not the first to wonder about this question; a lively and surprisingly technical discussion of the subject unfolded on the message boards of The Straight Dope about 15 years ago. Other online fora have picked up the subject, too, without, so far as I can tell, coming to a conclusive answer. For whatever it’s worth, Wikipedia, in its crowd-sourced semi-wisdom, goes the other way, placing D.O.A.’s venom on its list of fictional toxins — a database that I wasn’t aware the world needed, but there it is. Too much information is better than too little, I suppose. In any case, I’m not interested in whether the film’s “luminous toxin” could be phosphorus, say, or radium, nor am I interested in whether glow-in-the-dark poisons exist at all. I learned a long time ago not to drink the stuff that leaks out of the cracks in those dollar-store Halloween glow sticks, so I think I’ll be OK. The question that nagged at me after watching D.O.A. this time was: Why would this patently fictional film take the trouble to insist that one of its plot devices had a basis in reality? Who cares, really, if luminous toxin is real? (And I’m hardly convinced that it is.) What luminous toxin is — first, foremost and entirely — is a plot device. It’s the driver of the plot of D.O.A., and therein lies its entire function. Moreover, audiences who saw D.O.A. in 1949 — and who see it today — know full well that it is a work of fiction. Why, then, would the film’s makers find it necessary to insert this quasi-official explanation from Edward F. Dunne, M.D.? One answer, I suppose, is that Dr. Dunne’s declaration lends the film a vague sort of legitimacy. In basing the plot in some kind of putative medical reality, the filmmakers ostensibly gain by having the film's suspense seem all the more real. Yet, if this was the motive, the attempt seems unsucessful. The title card appears at the end of the film, so any boost in suspense wouldn’t occur until then, which seems to negate the purpose. And, really, would the tension in this fictional film have been diminished if the title card were not appended — or if writers Russell Rouse and Clarence Greene had invented a fictional poison for their script? Certainly not. Again, the poison is a plot device, so all it needs to do is motivate Bigelow’s sleuthing of his own eventual murder — a function it would fulfill regardless of its authenticity. The point is that the efficacy and irreversibility of the poison is important only in a fictional context. In this regard, the film is — like many Hollywood films — redundant in stressing important story details. 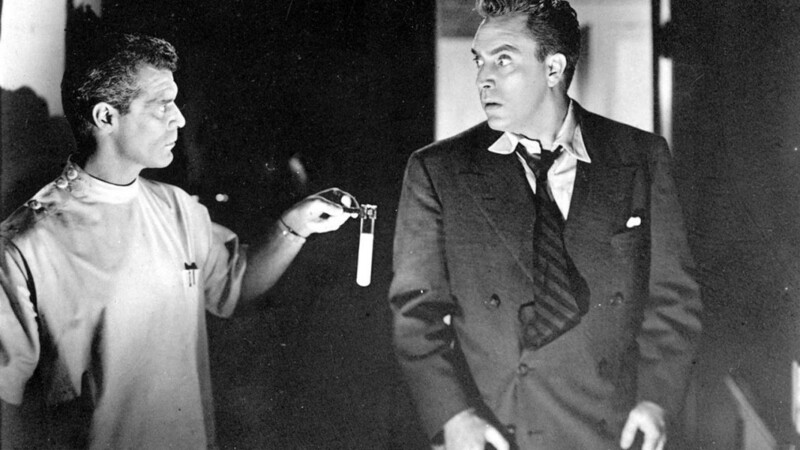 In D.O.A., Bigelow consults with three different doctors about the poison with which he has been dosed; one of them even demonstrates its luminosity by flicking off the lights and brandishing a glowing test tube. The words of these fictional doctors are surely more important than those of Edward F. Dunne, M.D., who has no place in the story of D.O.A. and who may not have existed at all. Movie producers have assuredly employed promotional strategies far less scrupulous than that one. I don’t have a conclusive answer to my question about the title card. Maybe it’s just a garden-variety disclaimer, akin to those commonplace end-credit notifications that a film was shot “on location” in certain cities. I strongly suspect, though, that it was a stab at bestowing some vague legitimacy on the film. And that, again, just poses the question: Why insist on the realism of a fiction film? Set the same story in a completely fantastical place and time — 6,500 years from now, say, on the interdimensional planet Shazbat — and the narrative function of the poison would be unchanged, even though its efficacy could not be medically verified. The more I think about it, the more this title card “pulls me out of” the film, in that it allows a tiny bit of the real world to permeate the diegesis of this work of fiction. I’d rather submit myself fully to the fictional mode. Fortunately, D.O.A. is a good enough film to weather such incursions.